Natural Greenwalls are environmentally-friendly walls of plants, which can be placed indoors and outdoors. Natural Greenwalls create an atmosphere that you like being in – physically and mentally. They last for years and are easy to setup and maintain. Natural Greenwalls make a difference! Try to move the green line and watch the difference. You will notice a clear and visual change when we add greenery to the wall. However, the visual difference is far from the whole. Natural Greenwalls can help you create an environment that makes everyone feel welcome. The vertical green walls can improve your indoor climate and work environment. With Natural Greenwalls you will experience a long list of improvements to the environment – both physical and social. Plant walls reduce noise, clean the air of dust, improve air quality by stabilizing humidity levels, stimulate job satisfaction, higher concentration levels, reduce stress, promote creativity etc. The result of being surrounded by greenery is clear. We just feel better! 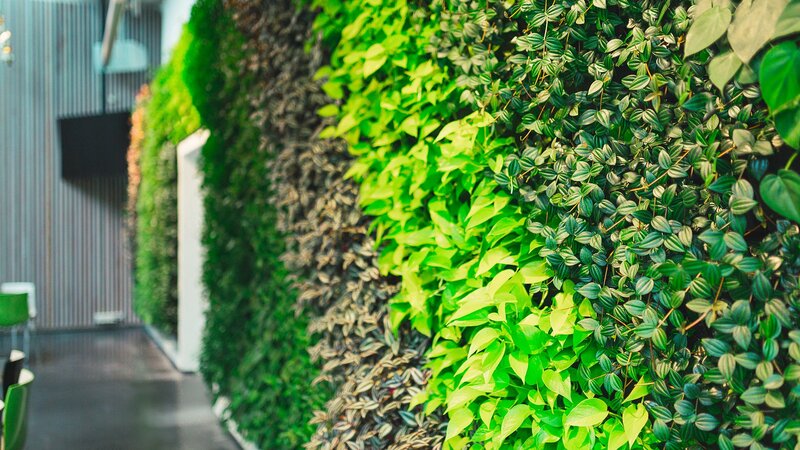 Natural Greenwalls are made of recycled plastic and can be reused again. The design of the pots minimizes water wastage by using the water in each reservoir in the best way possible. Power consumption is almost unmeasurable, since water is supplied rarely. Natural Greenwalls have a simple and practical construction of long-lasting materials. This offers many benefits when keeping the wall neat and clean and caring for it for many years. The pots are separated in a way that minimizes the spread of any disease and reduces maintenance fees. The system is entirely waterproof, meaning no water spills on the floor. Natural Greenwalls are also built to prevent algae from forming, which keeps your Greenwall fresh and clean for years to come. Natural Greenwalls is a Danish designed and produced living green wall. It was patented in September 2014. The system is already used in a large number of buildings; both new constructions and existing buildings. We have chosen to get a solution with a plant wall because we want something organic inside and something beautiful to look at. The quality and the way the plant wall is irrigated and maintained is very appealing. The system is quite simple and easy to maintain. We enjoy it every day and when I walk past it - whether it's upstairs or downstairs - it looks like it's growing really well. Natural Greenwalls has created an excellent product that we can use to create green environments inside our properties and we can do this without being afraid of damage from damp. We chose Natural Greenwalls because we found that the product is one of the strongest in the market; it’s well-tested. We have gone for quality as we always do in our properties. We chose a plant wall from Natural Greenwalls as we thought it could be an exciting element in the semi-open space which was originally intended for an orangery. Now it has an interesting expression that support the other furnishings. The reactions from both students and teachers were very positive from the very first day. The green walls are important from the visual as well as the environmental aspect. It contributes to a healthy indoor climate. The idea for Natural Greenwalls came from Ulrich Grønning. As owner of a traditional interior plant service company offering plant maintenance since 1998, Ulrich became interested in vertical green walls in 2011. After an intensive study of existing systems, Ulrich Grønning couldn’t find a vertical green wall system that was secure, simple, environmentally-friendly and where the plants could continue their development, ensuring they would last for years to come. The result was Natural Greenwalls – a unique, system that caters to architects, builders and all professional plant maintenance providers who can set up and maintain the simple system for their clients. And if you happen to be the end user, we will help you with the entire process, from the initial idea and planning phase through to completed installation. We are here for you with inspiring ideas, support and practical assistance. We want to pave the way for people and interior environments around the globe to enjoy Natural Greenwalls. Can’t find a suitable retailer? Don’t hesitate to contact us directly at info@naturalgreenwalls.com!